Iraq has celebrated the anniversary of its costly victory over the Islamic State group. The government declared victory last December after a three-year war that killed tens of thousands of Iraqis and forced hundreds of thousands from their homes. The Islamic State has lost nearly all the territory it once held. But its forces continue to carry out attacks on Iraqi targets. The government declared Monday a national holiday. Security stations in Baghdad, were covered with Iraqi flags and balloons, as security forces walked the streets, playing patriotic music. As part of the celebrations, the government plans to reopen parts of Baghdad’s well-guarded Green Zone to the public. Officials hope the move will calm protests against corruption and poor public services. The Green Zone is home to major government offices and foreign embassies. The celebrations come as political disputes have affected efforts to form a new Iraqi government. Abdul-Mahdi congratulated the security forces as well as the country’s top Shiite clergyman, Grand Ayatollah Ali al-Sistani. The clergyman approved a fatwa, or religious order, that brought in volunteers after the Iraqi army seemingly collapsed in June 2014. Tens of thousands of volunteers joined state-supported militias, many of them financed by Iran. That fatwa laid “the foundations of the victory,” Abdul-Mahdi said. He called on Iraqis to leave behind their differences and to come together for a better future. “The time has come to leave behind all the past mistakes…to open the doors of hope for our children for a better future,” he said. He promised to rebuild the destroyed areas and help displaced people return to their homes. “All Iraqis took part in this fight, those who couldn’t take up arms fought with words and donations,” said Qassim al-Fatlawi, who lives in Baghdad. He helped raise money for the militias. Songs praising the militias, also known as the Popular Mobilization Forces, could be heard coming from his small business in the city’s Karrada neighborhood. 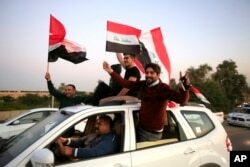 On Monday, the area was filled with Iraqi flags. “That victory…is a golden opportunity for the government to rebuild the country and to meet the needs of its people,” said Sameer al-Obaidi. He led a group of people who presented flowers to security forces in Baghdad’s Azamiyah neighborhood. The Islamic State (IS) group grew from the violent opposition that followed the United States-led invasion of Iraq in 2003. Based in Syria, IS forces crossed in Iraq in the summer of 2014. The Iraqi army collapsed, leaving the group to govern with a crushing form of Islamic rule. Thousands of people were killed. The group also kidnapped thousands of women and girls from the Yazidi religious minority and forced them into sexual slavery. Iraqi forces aided by a U.S.-led coalition fought to remove the group from all the territory it once held in Iraq. They fought to free Iraq’s second-largest city, Mosul. Today, Islamic State controls a small piece of territory in Syria, near the Iraqi border. Iraq is still badly affected by the violent rule of Islamic State. More than 1.8 million Iraqis remain displaced across the country. More than 8 million require some form of humanitarian aid. That number comes from the Norwegian Refugee Council. Those with suspected links to IS have been rejected by their communities. Thousands of children fathered by IS militants are still unrecognized by the state. Nearly two-thirds of displaced people say they are unwilling or unable to return home in the next year. And more than half say their homes were damaged or destroyed, said the aid group.